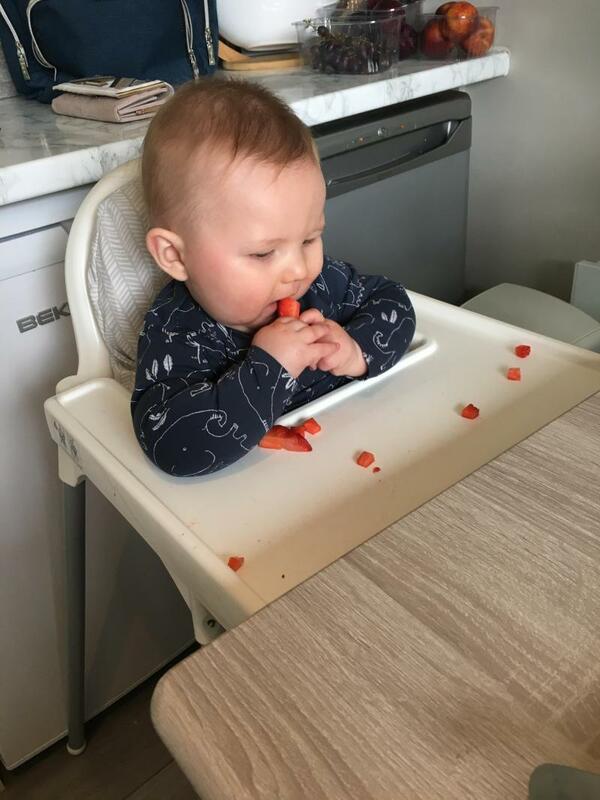 This highchair is inexpensive, does the work, easy to clean and holds my baby so well. Am so happy i settled with this cos ave had no regrets buying this. It’s so durable. 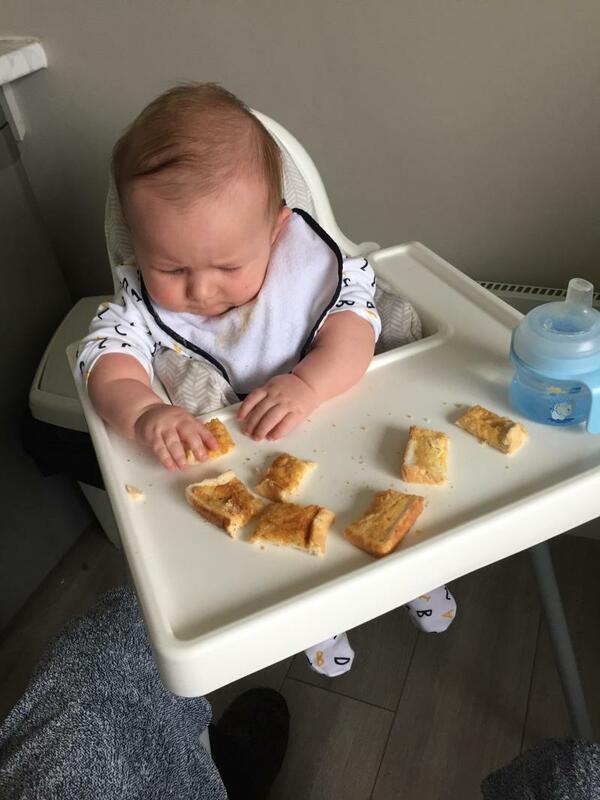 When I first started to research which highchair we were going to get for S, I was amazed at how many there were to choose from and at the staggering differences between the prices. At first I told my husband I wanted one of the fancy ones which would convert into a table for her as she grows up. Then I read a few reviews and realised that whilst it looked amazing and had different uses, it wasn't easy to clean at all. I already knew that we wanted to try a mixture of finger food and the occasional bit of spoon feeding so I was anticipating lots of mess. 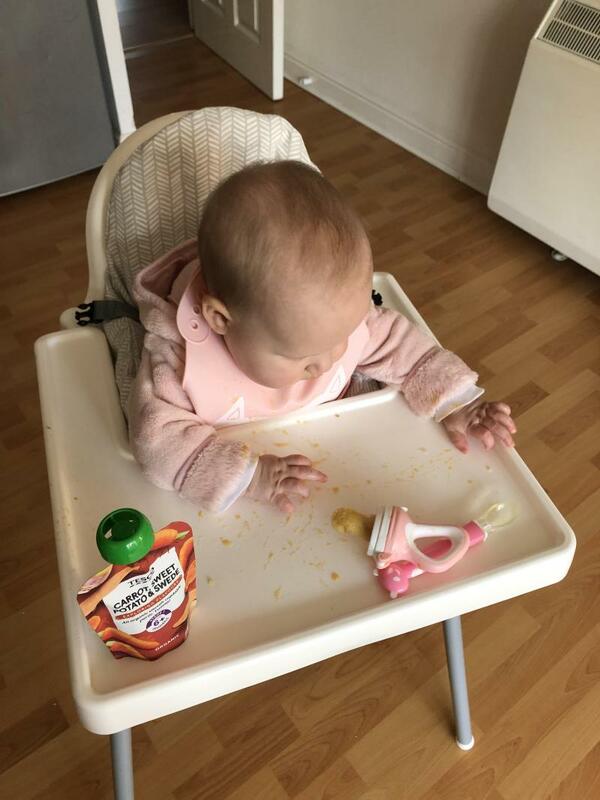 On lots of the baby led weaning websites the Ikea highchair was being highly recommended and at only £14 we decided it was worth getting one to try as it wouldn't be a massive waste of money if it didn't work for us. We decided to also get the grey cushion insert to go inside it too so that we could make it a bit more comfy for S. So far it has been amazing! S sits up nicely in the chair and seems to find it comfortable. It's really easy to take apart for storage if needed and for transporting to our families houses (we have lots of family dinners so this was a must for us). The best thing is that it's so easy to clean and keep that way! We spray and wipe it down after each meal and then around once a week I put the tray and straps in the top shelf of dishwasher for a more thorough clean. The cushion pops into the washing machine to keep it nice too. Though if she's feeding herself something particularly messy we sit her in it without the cushion and she's just as happy. At such a good price both sets of our parents have now bought one for their houses so S always has a space to eat there! Definitely a good buy! I really love this chair, I brought it for my son when he was 6 months old and he’s two now and I have used the same one since. I even brought another one to have at his grandmas house. It’s well worth the price and I have had no issues with it. I would like to see a better way of fastening the seat belt on it as it was a bit annoying to sort out initially. I really loved this product. We bought it when my son was around5 months and we gonna use it again for my second child in few months. It is really easy to assemble and doesn’t need a lit of space. It can be used in small houses. My son really enjoyed sitting in there and not only for meal times but even for activities like painting and messy play. It is very easy to clean, just need to wipe and the durt is gone. The only inconvenience is that the high chair and the other items are sold separately. Easy to clean, very cheap, inflatable insert for smaller babies. This is an amazing high chair. Such good value for money at around £10 plus a little extra for the insert. It doesn't look comfy but my baby loves it. It is so easy to wipe clean and doesnt have hidden creases to gather dirt. The tray is easily removed. 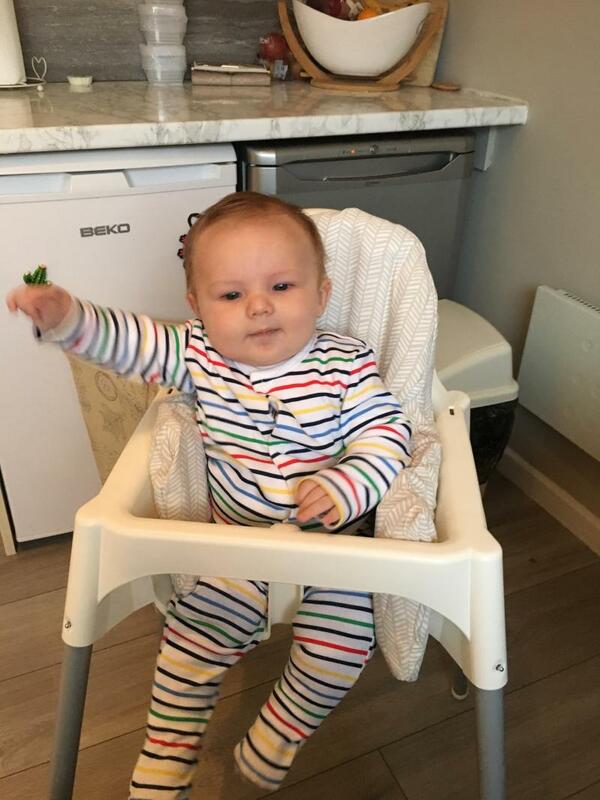 It is all you need in a high chair at a significantly smaller price than most. I have a premature baby and she's very small but can sit perfectly in this! It's hard to find something to fit a 22 week baby the size of a newborn but this one fold perfect! Would highly recommend to other mothers of premature babies or smaller. What a Highchair! Its been absolutely perfect for our little one in day to day family life. Hes been in it from just a few months old and it continues to be suitable even several months later with a vast size difference(theyre forever growing). We use ours several times a day-perfect height to allow the little one at the table. 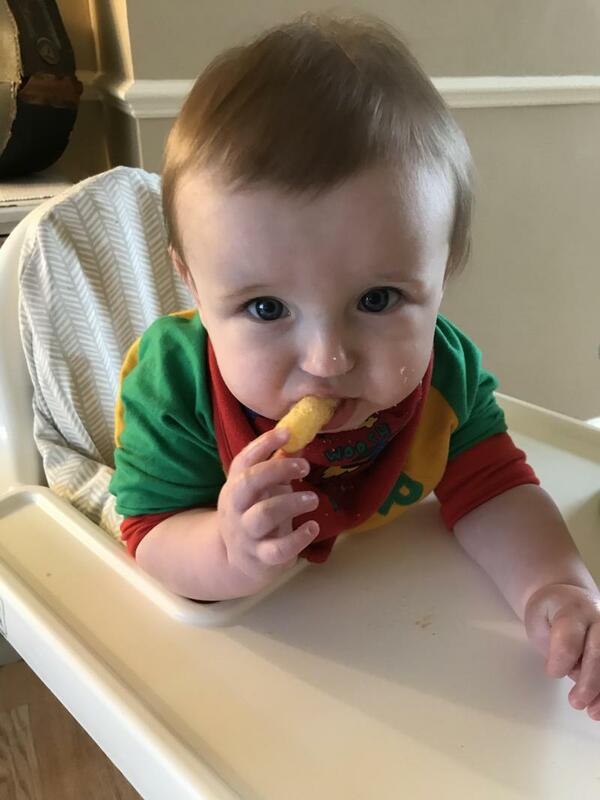 Hes so comfortable with the tray being easy reach for food and toys! it remains prestine white as it is soo easy to clean and store. With it being compact its perfect to stay up all day long! The price cant be beaten! would have happily paid double for this quality high chair. Easy to clean, comfortable for baby. Sturdy. Spare cushions - easy to change. Have to hit tray to get it off. For the price! Only £10 at IKEA at the moment, it’s amazing! So easy to wipe clean and to put my baby in! Only downside is that it does fold, but for the price who cares? Would defiantly Recomend! This is brilliant! Cheap and cheerful. Super easy to put together and clean. Can have with or without tray. Can be portable in car to other houses. This is all it is, a chair, doesn’t come with anything else. We recently bought this along with the inflatable cushion for our 16 week son. It was very affordable and easy to assemble. I love that it seems sturdy but isn’t too bulky so doesn’t take up too much space. Our son hasn’t begun to sit up on his own yet but with the inflatable cushion he fits in here lovely and seems to love it. Very easy to clean with a handy tray attachment too. Great product. Amazing value for money! Its so easy to put together and take apart. Very easy to clean and I love the part between the legs I feel it adds extra safety! The only downfall is its hard trying to store it without taking it apart as it doesn’t fold. However, this isn’t that big of a problem as the legs easily come off! Lovely product would 100% recommend to expectant mums! I typically prefer a 5 point harness as I feel it gives more security but this 3 point is just fine for its purpose, my only real pet peeve is that my boy can shuffle it along the floor whilst hes in it which doesn't feel super safe to me. None, apart from not good for babies under 6mths. We loved this chair. It could be wiped down easily, our baby loved it from 6 moths to 4 and a half yrs. the front comes off so child or baby can be close to table with everyone. Or put the tray back on and baby can eat off the tray. Whole thing is dish washer safe too. Bonus! 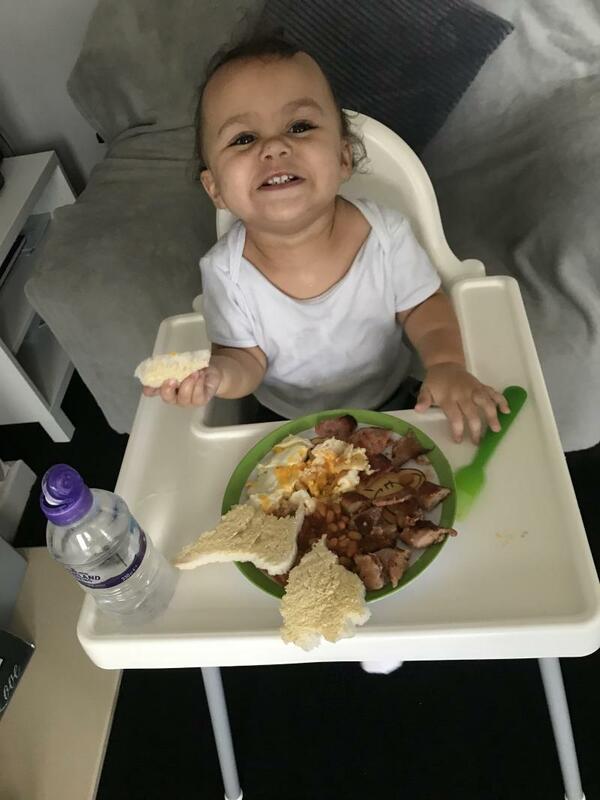 I love this high chair , it all comes apart even the legs for easy transportation and to wash everything , it doesn’t lay back it’s just a basic high chair , at an amazing price ! I have 2 of these and regularly use them with a 1 and 3 year old child. The design is great, the straps are around their waists so don't get dirty when they are eating. It's easy to clean and the legs can be removed for storage. The price is great, I've had other high chairs and none of them compare to this one. Excellent chair such a bargain! Easy to clean and dismantle when required. We have taken it away with us. Easy cushion to use and washable cover. Great safety straps. Love this chair!!! Great high chair. We just started to use it and it works for us perfectly. I love that it is all white. So not a big contrast in the dining area. only thing that it cannot be folded. so it takes some space. and also for 6 months old the insert cushion is a must. has enough space on the tray and it is easy to clean it. The design makes it easy to keep clean and also to transport if you choose to take it away with you. On a whole I love this high chair I’ve used it for both my children and have no complaints. It’s easy to build and to dismantle for any reason. Because of the design it’s so easy to clean and so is very hygienic dad there are no places for food to hide. I spent an awfully long time looking for a highchair as I wanted one that reclined, had a foot rest and folded away. 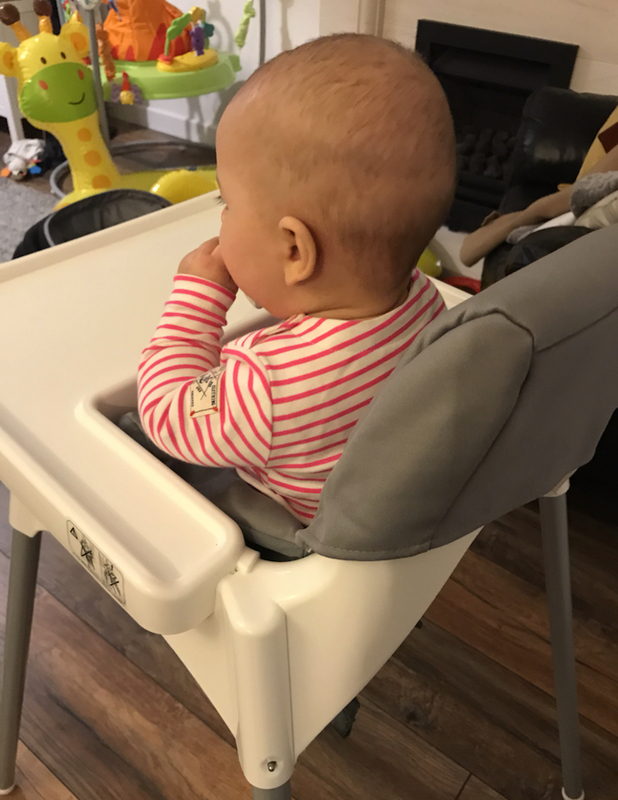 I kept seeing recommendations online about this highchair however I really didn't think it could be as good as people said for such a low price. My baby girl is 6 months and I thought she'd need one that reclines with a foot rest. When we were eating out I asked for a highchair to put her in and it was this very highchair we were given. Well she loved it. So I decided to go out and buy one and I've not had a single regret. It's so easy to clean and we bought the inflatable insert to go in. There are also lots of accessories made by other companies that go well with the Ikea chair. I bought some silicon plates which fit the tray perfectly and I also bought a tidy tray which expands the tray to stop baby from throwing food on the floor. All in all a very highly recommended best buy! 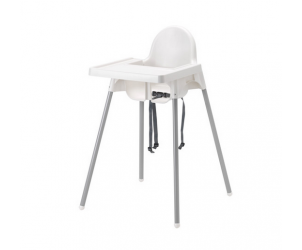 This high chair is good value for money,easy to clean and spacious for the child. It’s is also easy to remove the table so the chair can be pushed up to a dinner table when slightly older. It is really easy to dismantle and be taken to friends houses for dinner. 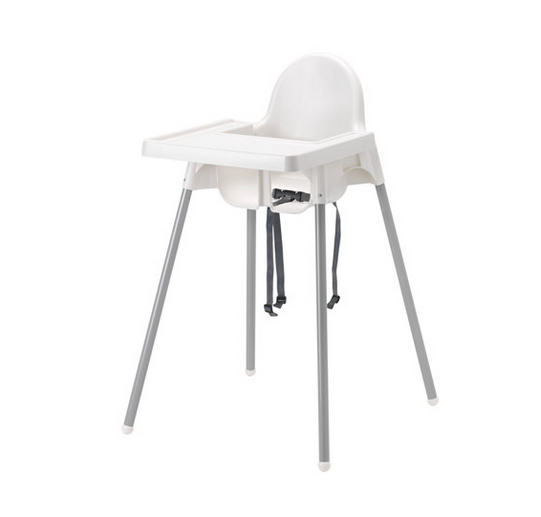 Best value highchair on the market, an absolute breeze to clean, 'goes' with every room because of its simple colour scheme, is easy to dismantle and very light, very secure with the straps. 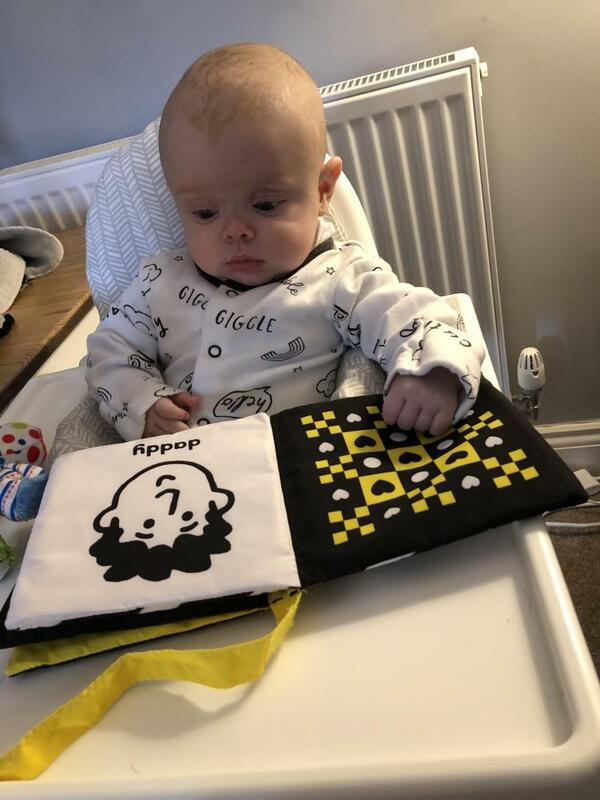 The IKEA ANTILOP Highchair makes it easy for small children to eat at the same table as grown-ups, helping them to develop social and eating skills.